Beginning in the 16th century and intensifying over the next four centuries, people from all over the world headed to North America in search of a new beginning. Of course, they never forgot where they came from, and all of them brought their traditions, adding them to the famed melting pot of the New World. The first wave of settlers, the Spanish, English, French, Scots, Irish, Dutch, Swedes, and Finns, also brought with them the building practices and architectural styles from their motherlands, thus creating in America what is known as the Colonial style. The Colonial style varied; it could mean New England colonial architecture, Spanish colonial architecture, German colonial, Dutch colonial, Swedish colonial, French colonial, and, primarily in the South, Georgian colonial. Nonetheless, what we are particularly interested in for this story are the earliest settlers and their New England colonial architectural style. 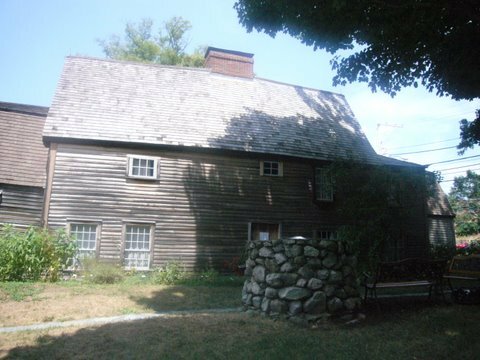 For this purpose, we head to Dedham, Massachusetts, where we find the oldest wood-frame house in North America: the Fairbanks House. Fairbanks House, photo taken in 1940. Among the first settlers to land on the shores of the New World were the Pilgrims, who arrived in 1620. In 1630, a larger group of around 1,000 Puritans settled in the British settlement known as the Massachusetts Bay Colony. 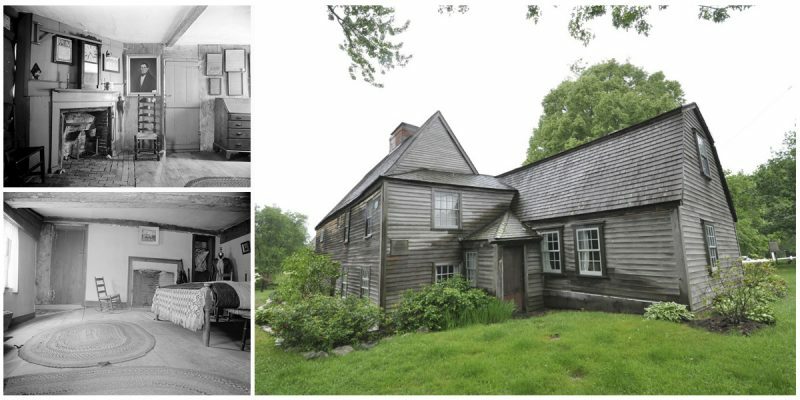 Puritans kept coming to the Massachusetts Bay Colony over the following years, and in 1633, Jonathan Fairbanks, the man who would go on to build the beautiful Fairbanks House, arrived with his family. 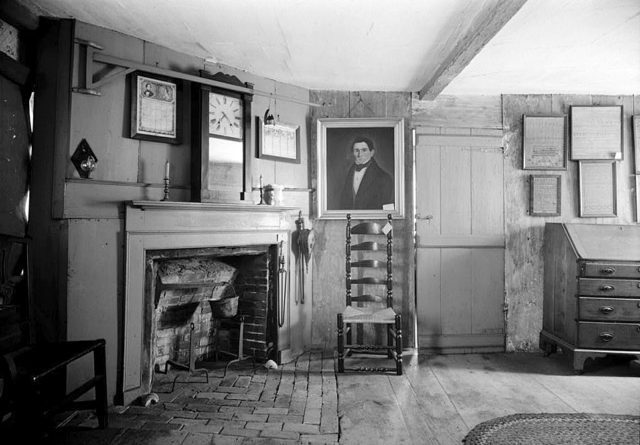 The house was built by Jonathan Fairbanks, and it stayed in this family for eight generations. Author: Swampyank. CC BY 3.0. 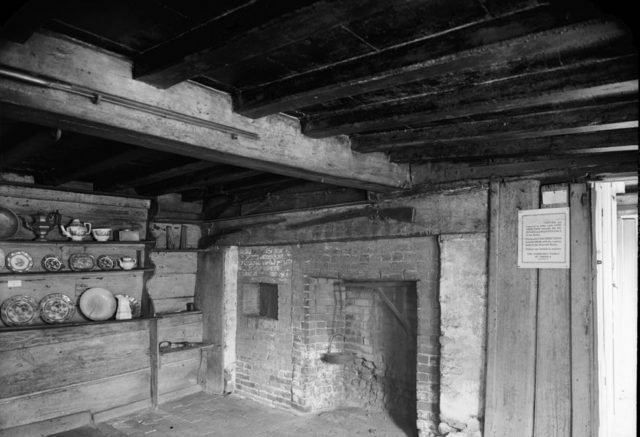 The Puritan family stayed in Boston for about three years, but Fairbanks’ six children needed more space, so he decided to move his family to Dedham, where he quickly started constructing the new house. 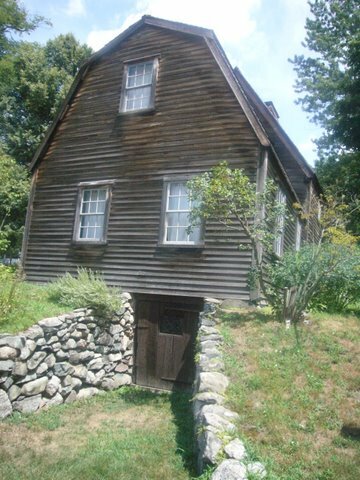 It was built around 1637, and it’s the oldest surviving wood frame house in North America. Author: Swampyank. CC BY 3.0. Just like the other Puritans who for religious reasons came to North America during the first half of the 17th century, Jonathan Fairbanks brought the traditions of house-building from his native England. With the use of local materials, he constructed the now famous Fairbanks House. The bedroom on the first floor. 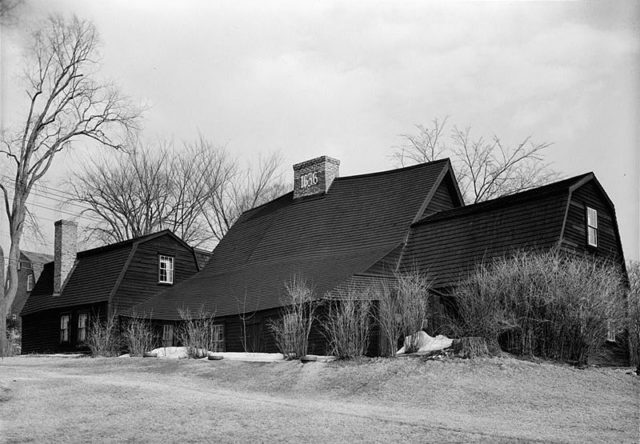 Nowadays, there are only a few colonial houses standing we can see throughout New England, but they are sufficient to know that the first colonists to New England (the Fairbanks family were among the first to settle in Dedham) primarily built one or two-story timber-framed houses with a massive central chimney and low ceilings. 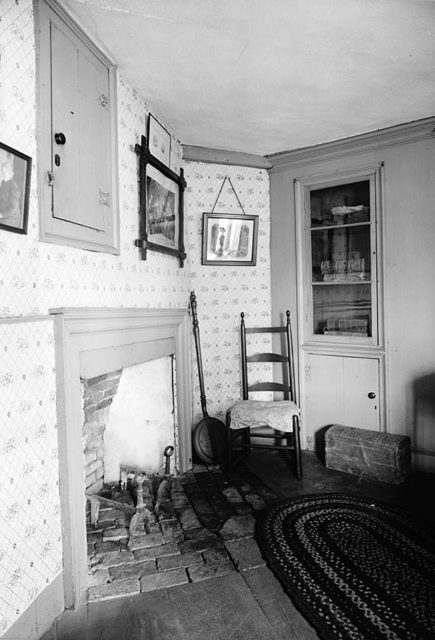 The parlor on the first floor. Like most of the houses constructed then, the Fairbanks House was built of oak and cedar with a large central chimney. Construction began in 1637 and according to dendrochronology testing, (a scientific dating method using the analysis of tree ring patterns), it took about four years before it was completed. 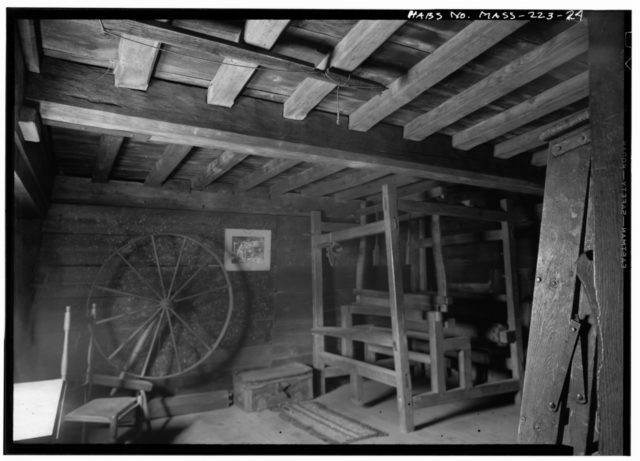 As mentioned above, there are a few more colonial houses in New England, but not all of them have been dated using dendrochronology, and until that day comes, the Fairbanks House remains as the official oldest house in New England. The workroom on the second floor. Apart from the fact that this house is nearly four centuries old, what is also fascinating about is that it remained in the hands of the Fairbanks family through eight generations. In 1904, the last member of the Fairbanks family moved out, but the house in a way remained in the possession of the Fairbanks when it was turned into a historic house museum by the Fairbanks Family Association about a year later. 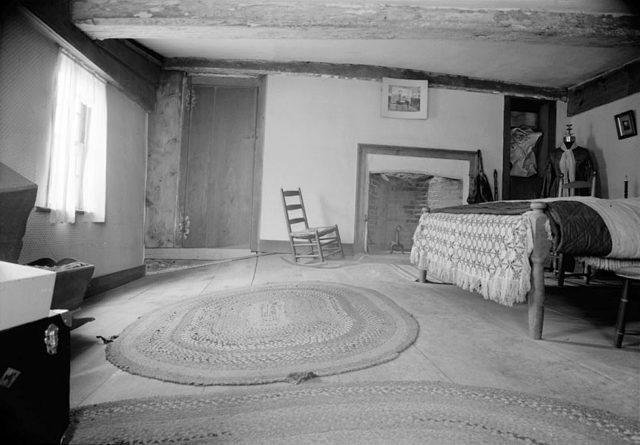 The bedroom on the second floor. Its authenticity is what has made this house a National Historic Landmark and a top tourist attraction in the area. The Fairbanks House stood strong through some the biggest changes in the history of the United States, so it is no wonder that over the years many historians and architects from all over the world have come to see it and learn of the stories of all the generations that once lived in this famous building.